Sam Francis, Bill Buckley, NRx. 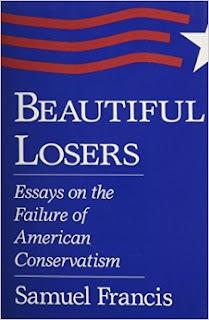 One of the books I've finally got around to reading is Sam Francis's Beautiful Losers: Essays on the Failure of American Conservatism. It's a book I'd highly recommend, in fact, its a book I'd insist that neo-Reactionairies include in their cannon because of the insights that it gives. I hope to make a few comments about the book in the next few posts, particularly with its relevance to the NRx but today I just want to make a brief comment on William Buckely, especially because there has been a lot of Buckley hate coming from the Alt-Right. I, like Francis, have a mixed opinion of Buckley. His purging of the "lunatic fringe" from the Right, in my mind was necessary for its survival in the post war period, but on the other hand, he was unable to successfully reinvigorate it during his stewardship of the National Review and led its drift towards NeoConservatism. Part of the problem, in my opinion, was due to his attempt to create a "broad church" Conservatism, but in doing so, he gutted the core elements of conservative beliefs. The other problem, as I saw it, was that Buckley enjoyed being an "intellectual" and felt that intellectual argument alone would save the day. This as Francis points out, was a fatal error and contributed much to political neutralisation of conservatism. Still, given the broad front from which attacks were being waged upon it, Buckley should be praised for keeping any sort of conservative operation alive at all. Francis recognises that whilst under Buckley's leadership all was not well with Conservatism but it also needs to be understood that Buckley was right in purging the conservative movement of it's more idiotic elements. Something NRx's should note. [Buckley] forcefully rejected what he called "the popular and cliche-ridden appeal to the grass-roots" and strove instead to establish a journal which would reach intellectuals. Not all conservatives agreed with this approach, but the young editor-to-be was firm. It was the intellectuals, after all, "who have midwived and implemented the revolution. We have got to have allies among the intellectuals, and we propose to renovate conservatism and see if we can't win some of them around." 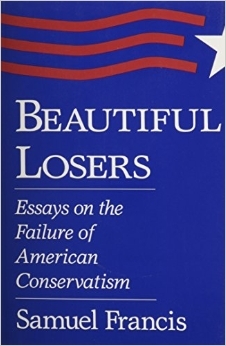 Yet while Buckley seemed cognizant of the "revolution" that had transpired and was, in fact, successful in attracting a number of intellectuals, he failed to see that the new intellectual class as a whole, which had indeed "midwived and implemented the revolution," could not become conservative. It could not do so because its principal interest, social function, and occupational calling in the new order was to delegitimize the ideas and institutions of conservatism and provide legitimization for the new regime, and its power and rewards as a class depended upon the very bureaucratized cultural organizations that conservatives attacked. Only if conservatism were "renovated" to the point that it no longer rejected the cultural apparatus of the revolution could intellectuals be expected to sign up. Moreover, by focusing its efforts in Manhattan, Washington, and the major centers of the intelligentsia and other sectors of the new elite, Buckley and his conservative colleagues isolated themselves from their natural allies in the "grass roots." While there was clearly a need for intellectual sophistication on the Right, the result of Buckley's tactic was to generate a schism between Old Right intellectual cadres and the body of conservative supporters outside its north-eastern urban and academic headquarters. Among these supporters in the 1950s and 1960s there flourished an increasingly bizarre and deracinated wilderness of extremist, conspiratorialist, racialist, and even occultist ideologues who loudly rejected both the Old Right mainstream and the Old Right's new friends in the intellectual and cultural elite, but who failed to attract any but the most marginal and pathological elements in the country and exerted no cultural or political influence at all [ED]. At various times in its history, National Review has found it necessary to "purge" itself of such adherents, and each catharsis, no matter how prudent, has rendered its "renovated" conservatism less and less palatable to ordinary Americans and more and more acceptable to the Manhattanite intelligentsia it has always sought to attract. Here Francis teaches NRx an important lesson. Firstly, whilst NRx is not populist, it's going to be irrelevant if it's not popular. Simply being an intellectual exercise is not enough. Francis has more to say on the subject which I will comment on in later posts. But the other thing Francis realises is that Buckley's purges were necessary since many of the those attracted to the conservative movement were actually hostile to the "Old Right". 1) Trying to conform to the establishment. 2) Not having an adequate enough yardstick by which to measure a Conservative's credentials. 3) Purging the obvious psychopaths whist missing the more cunning snakes. i.e Neoconservatives. It's the latter two points which worry me the most with regard to current developments in the dissident Right. Looks a bit like history repeating.